You are here: Home / 7-Day Detox Cheat Sheets Delivery! 7-Day Detox Cheat Sheets Delivery! 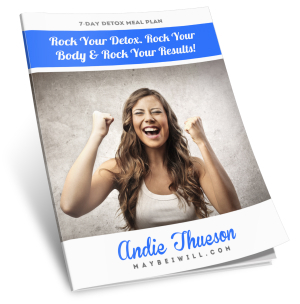 I am so excited for you to try my ROCK Star 7 Day Detox Plan! It works great with any of the detox water recipes I have on my site! I absolutely love hearing from my readers on how well they did – and how completing this detox has helped them to lose some weight and feel refreshed and rejuvenated! Feel free to tag me on social media as well! @andiethues on Twitter and Instagram! Ohh and Also have you joined my Secret Facebook Group?? >> If you are wanting extra motivation and support, come join my Fit Family!! I post daily motivation and workout and wellness tips! Just click the picture below and hit “join” and I will add you as soon as I am able.